In this episode of the Bible Contradictions, I’m going to expose a contradiction that often — by most efforts to understand the bible — goes unnoticed. The question we will ask the bible is how old was Benjamin when he came to Egypt? Unfortunately the bible gives us different answers. First, if we look to Genesis chapter 44, we find two verses that claim Benjamin was a small child — maybe even a baby — when he came to Egypt. In verse 20 Benjamin has been kidnapped by Joseph. Judah comes to beg for his release and calls him a “young brother” or a “child,” depending on the translation. This is followed by verse 22 where Judah tells Joseph that if “the boy” or the “lad” is taken from his father, the father will die. This second verse tends to imply that the father will die of heartbreak from being separated from his infant son. It’s doubtful the father would die from being separated from a grown son because, as we see in chapter 46, Benjamin’s father came to Egypt with a long list of family members. So we skip ahead to chapter 46. The chapter begins by listing all of the Israelites who came to Egypt. The list is quite long. And for the sake of this post, all we need to do is to focus on two verses. Verse 8 tells us that this is the list of people who came to Egypt in the story in chapter 44. In other words, this is not a second coming to Egypt. 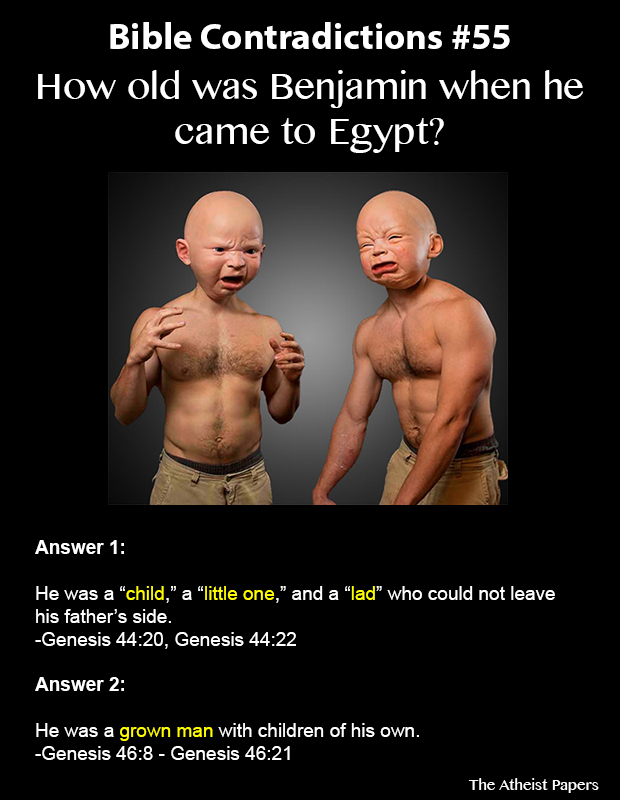 Verse 21 tells us that Benjamin was a grown man with children of his own when he came to Egypt. This is a very, very easy contradiction to miss because verses 8 through 27 of chapter 46 is one giant list of names of grown men and women and their children. Some might argue that “young brother” or “lad” or “the boy” or “child” don’t refer at all to Benjamin’s age, but rather they refer to his status. For example, “young brother” is a vague term. How young is “young”? “Lad,” “the boy,” and “child” are even more vague. They could merely be defining Benjamin as the child of Jacob instead of a prepubescent boy. To be honest I don’t know the answer. The bible is too vague to determine what it actually means by these words. Indeed the Hebrew word for child, which is “yeled” and is commonly used in the Jewish scripts, doesn’t help either. “Yeled” can mean anything from “child” in the literal sense to “descendant.” In other words, I don’t know if this is actually a contradiction because the bible offers us no explanations of what it means by these words. But the opposite can be said to any apologist: They don’t know if this is actually not a contradiction either. No one knows. It’s a puzzle we can never solve. Then again, the literal words are absolutely contradictory. This entry was posted in Bible Contradictions and tagged Atheism, Bible Contradictions, Christianity, God, Judaism, Religion, the bible. Bookmark the permalink. 2 Responses to Bible Contradictions #55: How Old Was Benjamin When He Came to Egypt? A correction for you brother Zehn– the family of Jacob/ Israel resettled in Egypt at the conclusion of their final trek to bring Jacob during the famine- A full reading beyond verse 8, say looking at verse 20, (chap 46) you will observe the shift to descendants born in Egypt and where it goes on to cover general linuage. Benjamin’s children came some time after the families were settled and at peace with the Egyptian Kingdom. What a shame that you read scripture only for the purpose of steering souls from them and the peace they have brought to so many. Perhaps one day you will read them for a more noble purpose. Which prompted me to seek out Benjamin’s age, as in this reading, it appears that Joseph has been gone for a very long time. Long enough for his appearance to change so much that not a single one of his brothers even recognizes him, not even his youngest brother whom he adores, Benjamin. Then we read that Benjamin’s family came out of Caanan with his fathers other family, and it lists the “son’s of Benjamin” as being TEN son’s, with no mention of any daughters. It also does not mention if all these son’s were from one wife, which is a question which could effect the age of Benjamin, considering the 9 month period to birth a child and recovery time, as that would put at least one year between each child. One cannot “presume” to know this though. What this does tell us though is that Benjamin was at an age where he was old enough to procreate. He was not a child or an infant or even most likely a teen. He was a full grown man. However, does this also mean that Jacob’s soul could not have been “bound up in” him? Absolutely, positively, NOT! Jacob had labored 14 years for his wife Rachel, due to duplicitous behavior on Rachel’s fathers part. Then Jacob labored an additional 7 years with her father to make certain that Jacob would be able to support Rachel and her sister and all their children before taking them away. So Jacob’s entire early life was spent in QUEST of Rachel and Rachel’s happiness. And then Rachel proved to be barren and it was not until later that Rachel ever bore Jacob a son. That son was Joseph. And because Jacob loved Rachel more, of course Joseph was the favored son. And then Rachel died in child birth giving birth to her only other son, Benjamin. This is a serious Trauma Bond. A new life which also brings death. So do we see how that kind of traumatic imprint might have caused Benjamin to be “bound up” in Jacobs soul? Does it really matter how old that son was, to see that he was indeed the youngest, the last of the favored wife and that much trauma had come to Jacob from his love of Rachel and her offspring? I do not find this contradictory, only curious and it makes me dig and research further. Try not to let the translations of this Biblical “story” make you believe that all is a lie. And also remember that men wrote these stories. And although they may be divinely inspired, if you can fathom how many languages these texts were translated to / from and to again, you would have more patience with them. Without faith, we lose hope. Without hope, we falter, we are disconnected and we wonder incessantly about “Why” we are here. There is a divine intelligence in all things, including us. If we were not meant to worship a “Creator” then that divine spark of longing would not be present in us. Think about it! When we lose our faith in our Creator, we start worshiping something else! We worship idols of money, work, sports, sports figures, fame, famous people, and even our own reflections. We have an undeniable NEED to worship. Where did that come from, if not from the one who created us?